During the early 1930s, the U.S. government arranged for grieving “Gold Star Mothers” to visit the French burial sites of their sons killed during World War I. 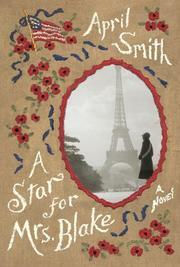 This historical fiction by mystery author Smith (White Shotgun, 2011, etc.) concerns a woman named Cora Blake and her travel companions. Plucky, no-nonsense Cora is a librarian from Deer Isle, Maine, and a single mother of a son, when she gets the government invitation in 1931. She becomes the member coordinator and organizes the banally diverse group of women assigned to travel together: Jewish Minnie Siebert, who must defy her husband to travel from their farm in Bangor; Irish Catholic Boston housemaid Katie McDonald, who lost two sons in the war; and well-to-do society matriarch Mrs. Bobbie Olsen, who, like Cora, has a secret she’s not telling. The fifth member of the party, Wilhelmina Russell, does not respond to Cora’s letters, but Mrs. Russell does show up to travel on the train from Boston to New York. Only this is Selma Russell, a black seamstress, stereotypically large and comic—discomforting whiffs of race and class snobbery filter throughout the novel. A snafu has mixed up the two Mrs. Russells, and Wilhelmina, a deeply disturbed middle-class housewife recently released from a mental hospital for the journey, has ended up in Harlem. Assigned to chaperone the women, 2nd Lt. Thomas Hammond fixes the mix-up, with the help of nurse Lily Barnett, by resegregating the women before they board the ship for Europe. By the time they reach Europe, Cora and Bobbie have bonded, while romance between Thomas and Lily is palely flickering. In Paris, Cora meets journalist Griffin Reed. Badly wounded and disfigured while covering the war, he sees the possibility of a story in the women’s journey. Throw in Reed’s hedonistic lover and a nasty senior officer who resents Thomas’ privilege, and the trip goes more than slightly awry. While the line-by-line writing is engaging, this take on historic events is made shallow by broad brush strokes and lots of heartstring pulling.